Aito Renses was pleased to see a fighting attitude by his players. Alba Berlin coach Aito Reneses expressed his happiness following his team’s win over Valencia in Game 2 of the EuroCup Finals. Not only for the result of the match, which forced a Game 3 in the series, but also because his team put on a highly competitive spirit on the court. “For the moment I’m happy because I wanted mainly to compete and we competed. If we lost I’d be happy because we competed. 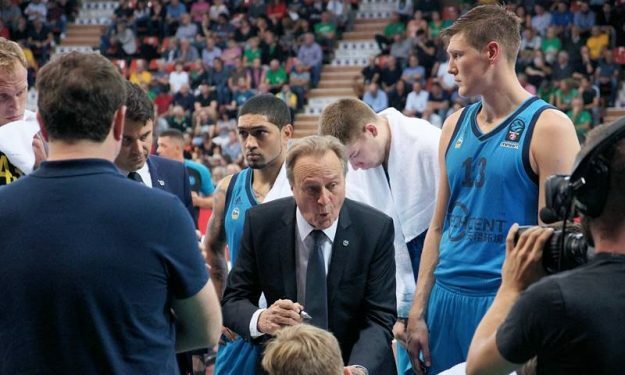 To play in front of this Mercedes Benz Arena, full of people enjoying the game, is very good for our team,” Reneses said after being asked how he will approach Game 3, per EuroCup Basketball. “Perhaps we played with better confidence in ourselves, with the difficulty that in front of us there was a team like Valencia scoring every time from long distance, but in the final plays we had faith in winning the game,” Reneses added. Confidence was key for Alba Berlin that had to give a match of no return against a battle-hardened Valencia team. The Spanish side has players like Bojan Dubljevic, Fernando San Emeterio, Will Thomas or Joan Sastre that carry experience in the EuroCup finals. Another thing that Alba players also had, was faith in each other. “It was very tough [sitting out at the end], but I had full confidence in my teammates, Martin got a chance to rest and he’s been great for us all game, Luke stepped up really big, Landry came in and got the rebounds and made two free throws,” Alba guard Peyton Siva said.